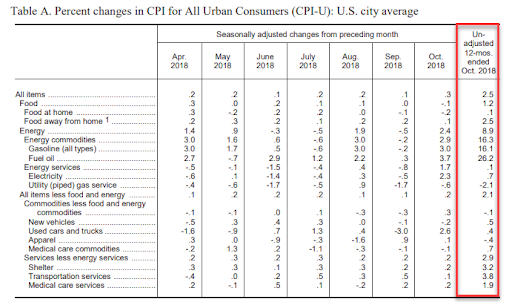 After producer prices printed hotter than expected (surging most MoM in six years), hawkish fears were modestly allayed as consumer prices rose 2.5% YoY (as expected), a small rebound from September's 2.3%. But core CPI slowed to +2.1% YoY - its weakest since February and below expectations of a 2.2% rise. 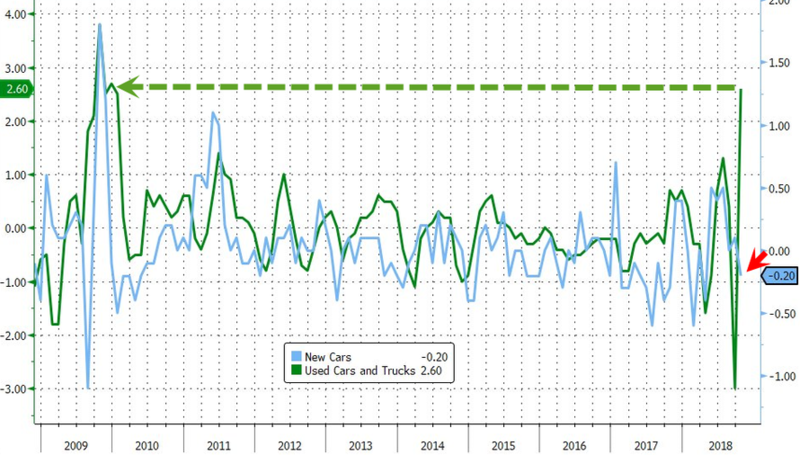 The October advance in the CPI benefited from some bounce-back from September: used-car prices rose 2.6 percent, the most since 2009, after posting the biggest monthly drop in 15 years. The measure has been volatile since the Labor Department changed its methodology earlier in 2018. New car prices, by contrast, weighed on inflation in October, falling 0.2 percent from the prior month, the biggest drop since April. Energy prices rose 2.4 percent from the previous month, while food costs fell 0.1 percent. The shelter index rose 0.2 percent in October, the same increase as in September. The rent index rose 0.2 percent and the index for owners' equivalent rent advanced 0.3 percent. 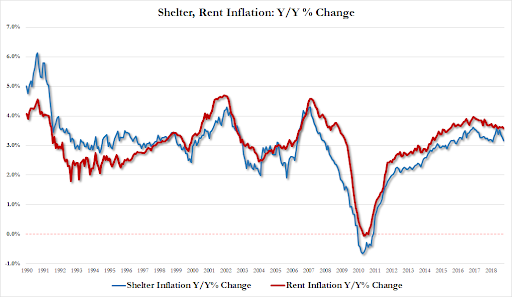 Policy makers and economists look at core inflation as a better indicator of underlying trends because the broader figures are subject to bigger swings from energy prices, and given the fact that they remain above the 2% level, it would appear The Fed is guns-hot for a Dec rate hike no matter what.